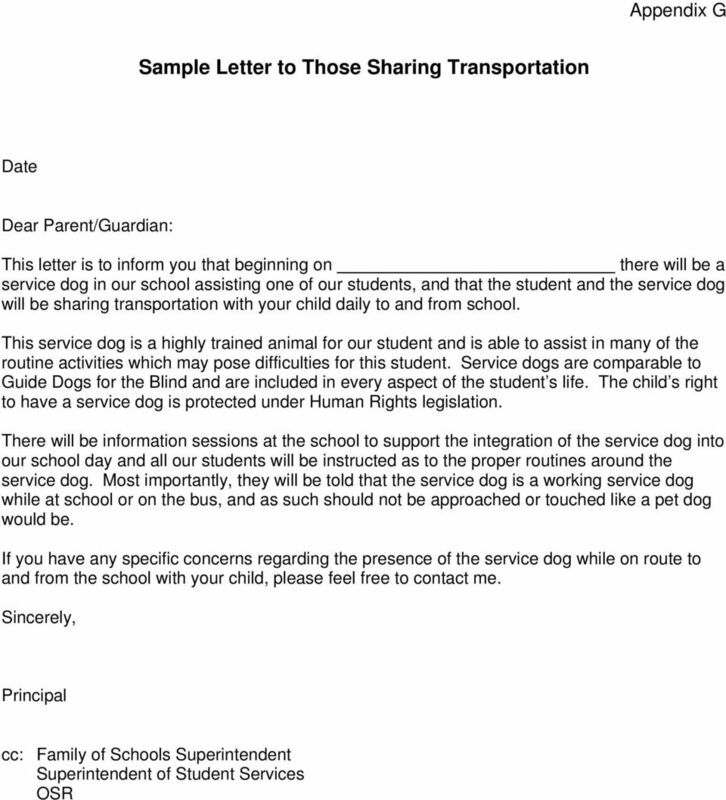 7 Appendix A Request for Service Dog Involvement with a Student Package Information for Parents/Guardians Requesting a Service Dog in the School Dear Parents/Guardians: The successful implementation of a service dog into a school setting depends on clear communication, a well-informed school community and careful planning. This package will help you provide the necessary information to assist the Principal to make the best possible decisions for your child and other students as well as for the staff, volunteers, and visitors in the school. The information will be filed in your child s Ontario Student Record (OSR). 1. The use of a service dog is considered to be an accommodation to help your child learn and to develop the necessary skills to achieve success and independence at school. 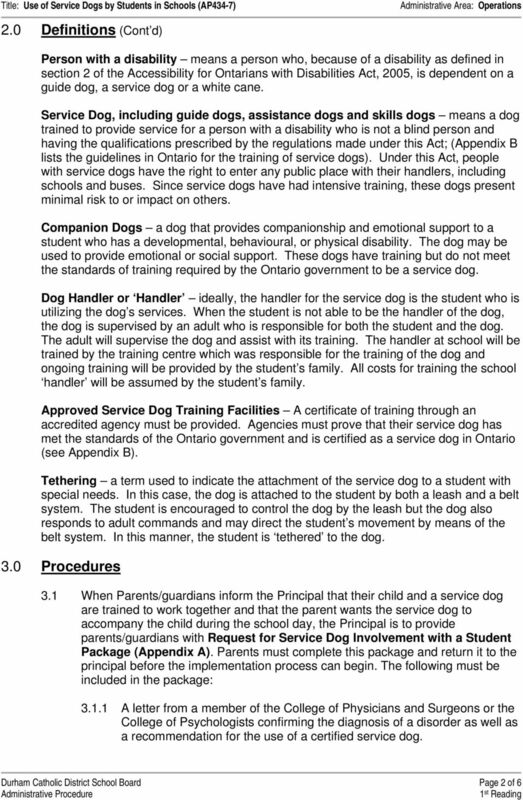 The use of a companion dog is generally not considered to be an accommodation under the Ontario curriculum. If your child already has an Individual Education Plan, it will be reviewed at a School Team Meeting, or one will be developed in consultation with you. 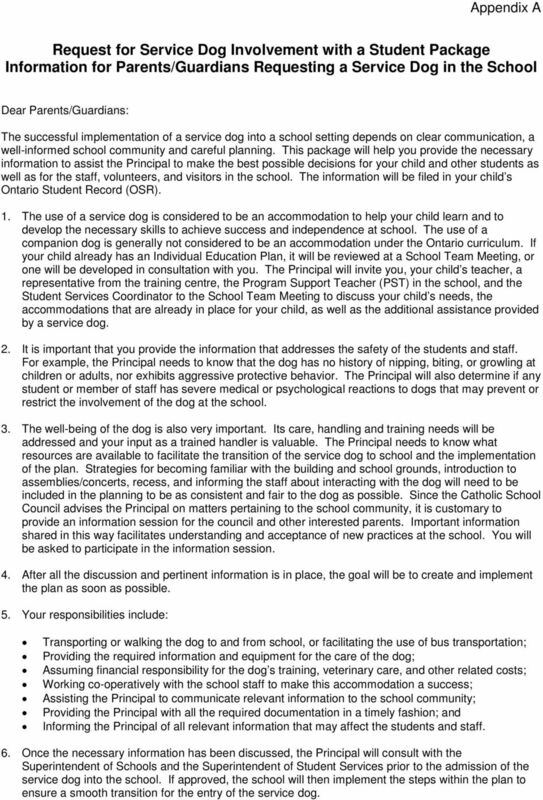 The Principal will invite you, your child s teacher, a representative from the training centre, the Program Support Teacher (PST) in the school, and the Student Services Coordinator to the School Team Meeting to discuss your child s needs, the accommodations that are already in place for your child, as well as the additional assistance provided by a service dog. 2. It is important that you provide the information that addresses the safety of the students and staff. For example, the Principal needs to know that the dog has no history of nipping, biting, or growling at children or adults, nor exhibits aggressive protective behavior. 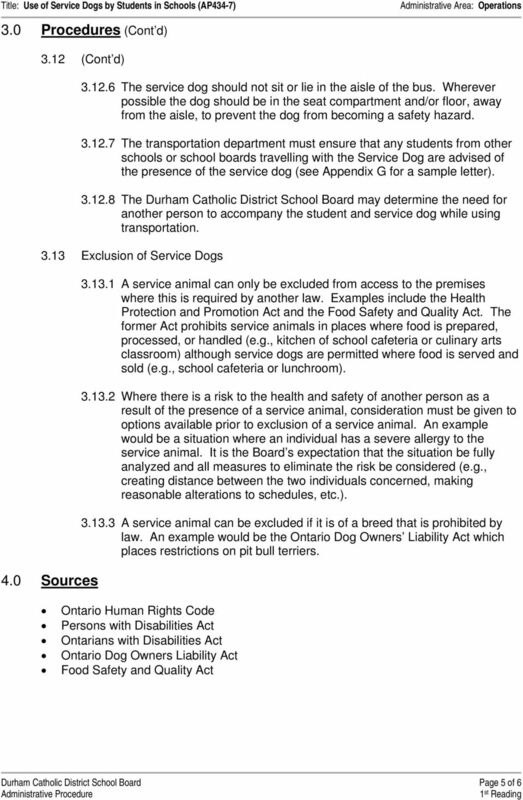 The Principal will also determine if any student or member of staff has severe medical or psychological reactions to dogs that may prevent or restrict the involvement of the dog at the school. 3. The well-being of the dog is also very important. Its care, handling and training needs will be addressed and your input as a trained handler is valuable. 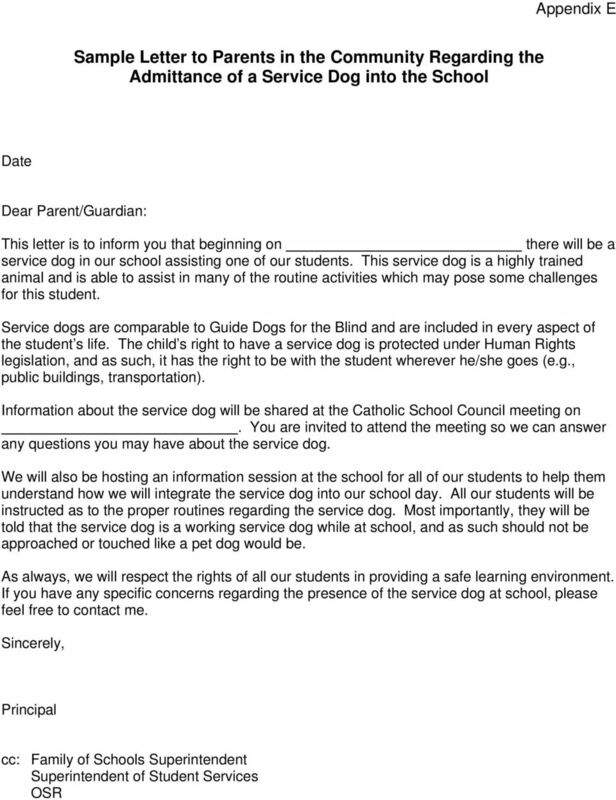 The Principal needs to know what resources are available to facilitate the transition of the service dog to school and the implementation of the plan. 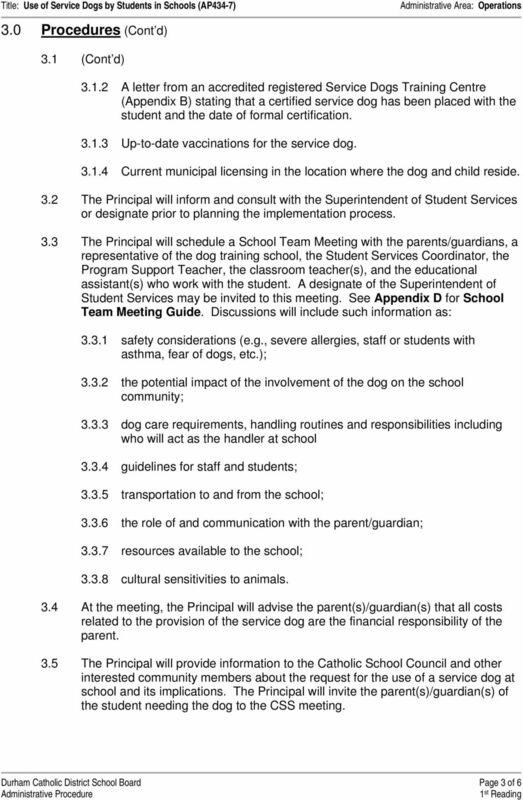 Strategies for becoming familiar with the building and school grounds, introduction to assemblies/concerts, recess, and informing the staff about interacting with the dog will need to be included in the planning to be as consistent and fair to the dog as possible. Since the Catholic School Council advises the Principal on matters pertaining to the school community, it is customary to provide an information session for the council and other interested parents. Important information shared in this way facilitates understanding and acceptance of new practices at the school. You will be asked to participate in the information session. 4. After all the discussion and pertinent information is in place, the goal will be to create and implement the plan as soon as possible. 5. 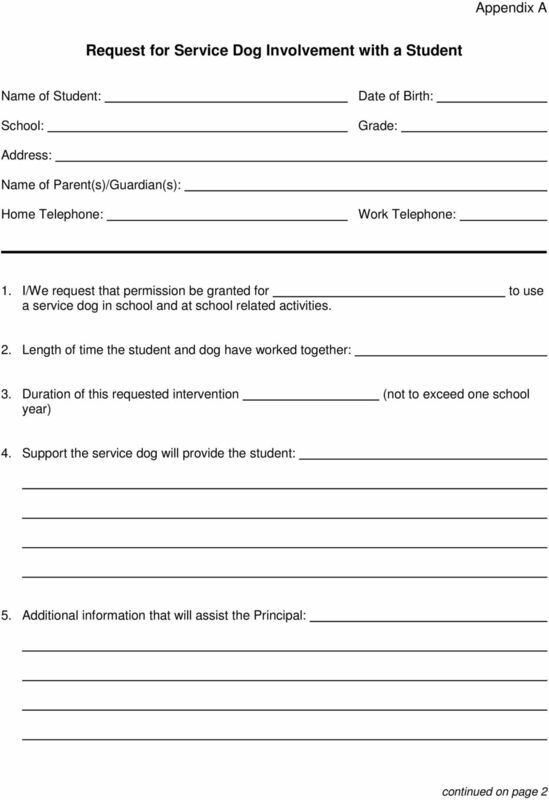 Your responsibilities include: Transporting or walking the dog to and from school, or facilitating the use of bus transportation; Providing the required information and equipment for the care of the dog; Assuming financial responsibility for the dog s training, veterinary care, and other related costs; Working co-operatively with the school staff to make this accommodation a success; Assisting the Principal to communicate relevant information to the school community; Providing the Principal with all the required documentation in a timely fashion; and Informing the Principal of all relevant information that may affect the students and staff. 6. 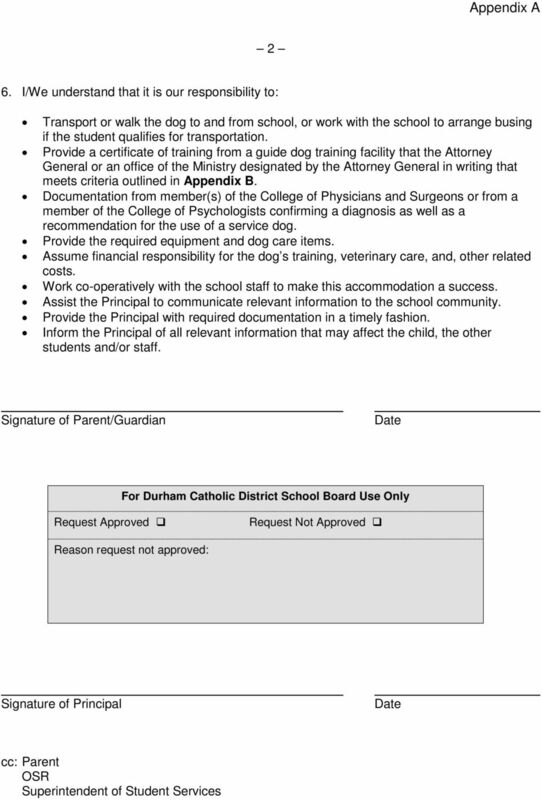 Once the necessary information has been discussed, the Principal will consult with the Superintendent of Schools and the Superintendent of Student Services prior to the admission of the service dog into the school. 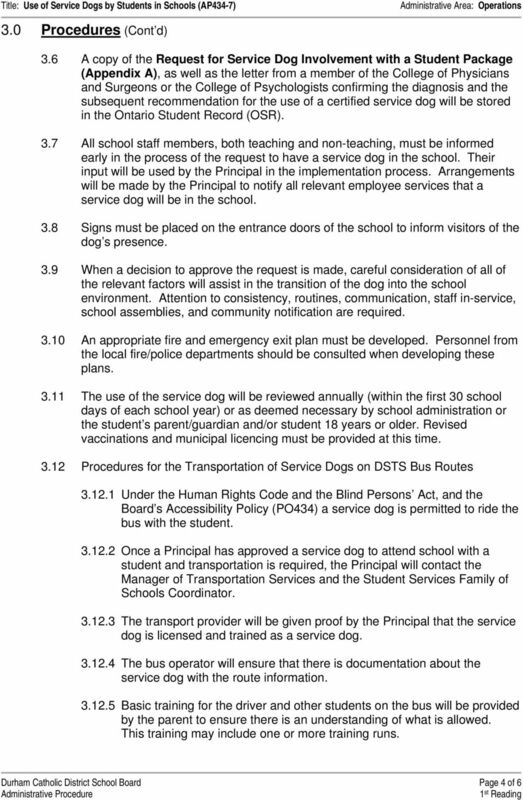 If approved, the school will then implement the steps within the plan to ensure a smooth transition for the entry of the service dog. 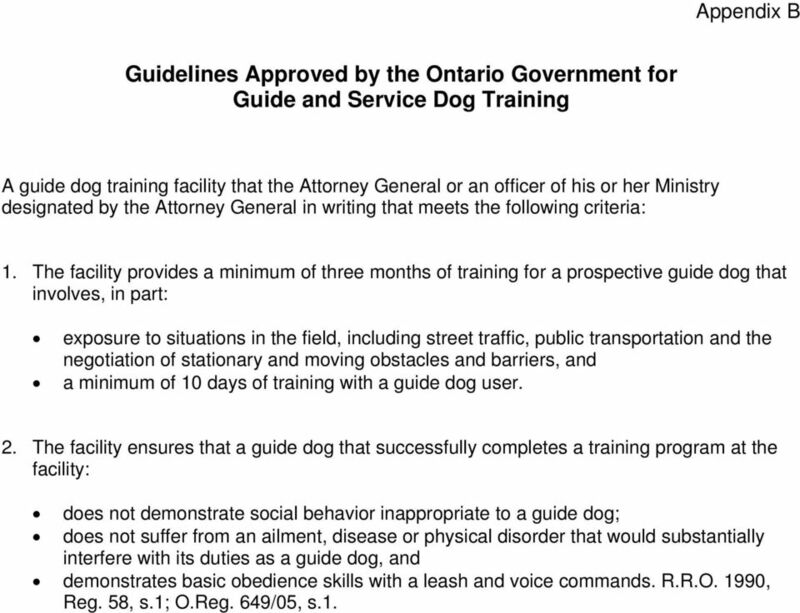 10 Appendix B Guidelines Approved by the Ontario Government for Guide and Service Dog Training A guide dog training facility that the Attorney General or an officer of his or her Ministry designated by the Attorney General in writing that meets the following criteria: 1. The facility provides a minimum of three months of training for a prospective guide dog that involves, in part: exposure to situations in the field, including street traffic, public transportation and the negotiation of stationary and moving obstacles and barriers, and a minimum of 10 days of training with a guide dog user. 2. The facility ensures that a guide dog that successfully completes a training program at the facility: does not demonstrate social behavior inappropriate to a guide dog; does not suffer from an ailment, disease or physical disorder that would substantially interfere with its duties as a guide dog, and demonstrates basic obedience skills with a leash and voice commands. R.R.O. 1990, Reg. 58, s.1; O.Reg. 649/05, s.1. 12 2 Task Date Completed Inform School Council and community at the School Council meeting and receive their input. 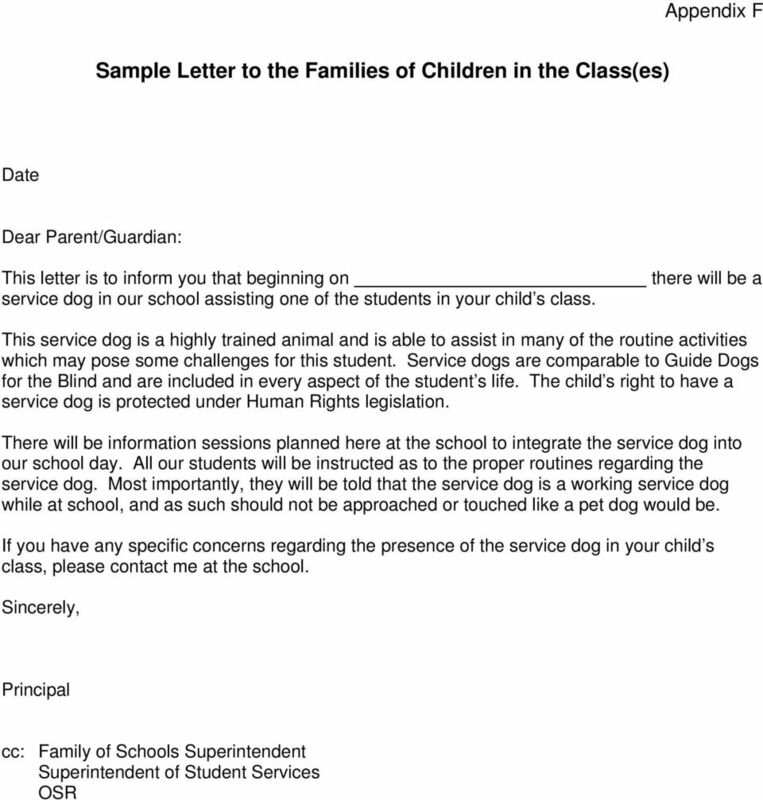 (Use Appendix E Sample Letter to Parents in the Community Regarding the Admittance of a Service Dog into the School. Meet with parent(s)/guardian(s) and/or student 18 years or older, to inform them of the information you have received, and to review the implementation plan, including the fire and emergency exit plans. Advise the Family of Schools Superintendent and the Superintendent of Student Services, of your actions. Develop a communication strategy to inform students, staff, community and relevant employee representatives: Parents (Appendix E) Staff meeting School Council Classroom presentations (Appendix F) All students Bus staff and parents of students requiring transportation on same bus (Appendix G) Post signs on the entrance doors and at any other places to advise visitors of the dog s presence. 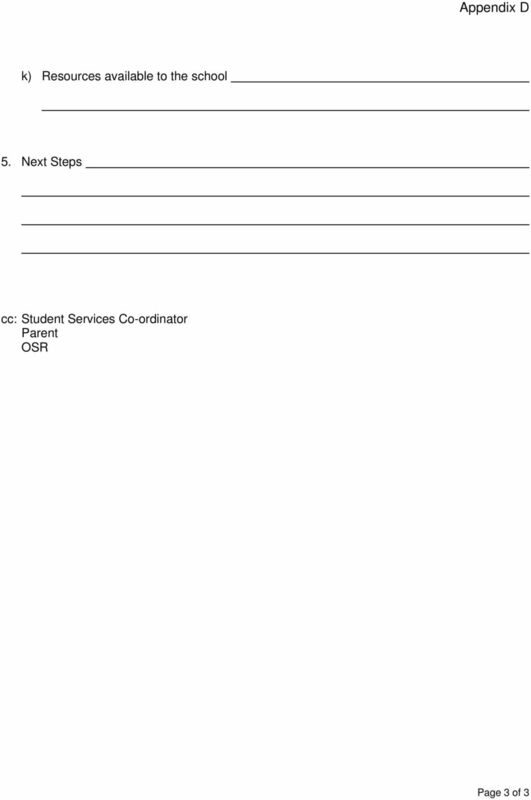 File relevant documentation and correspondence in the documentation file of the student s OSR. 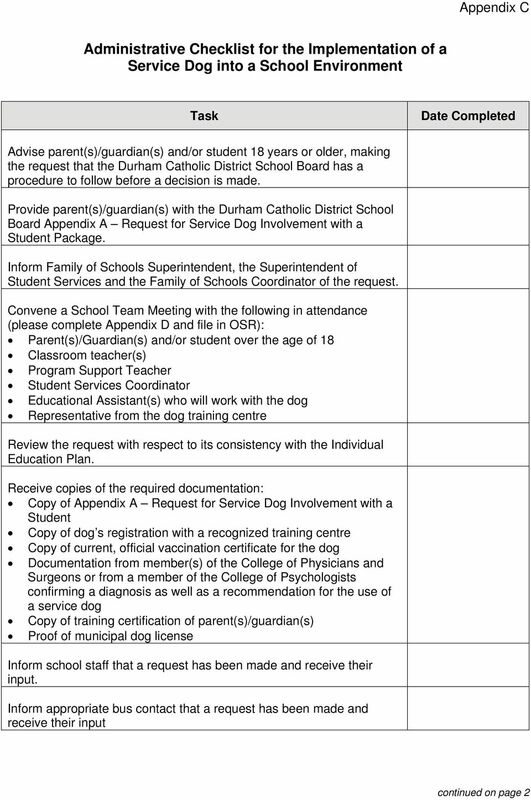 Review Appendix A Request for a Service Dog Involvement with a Student, annually and in the first 30 days of each new school year. 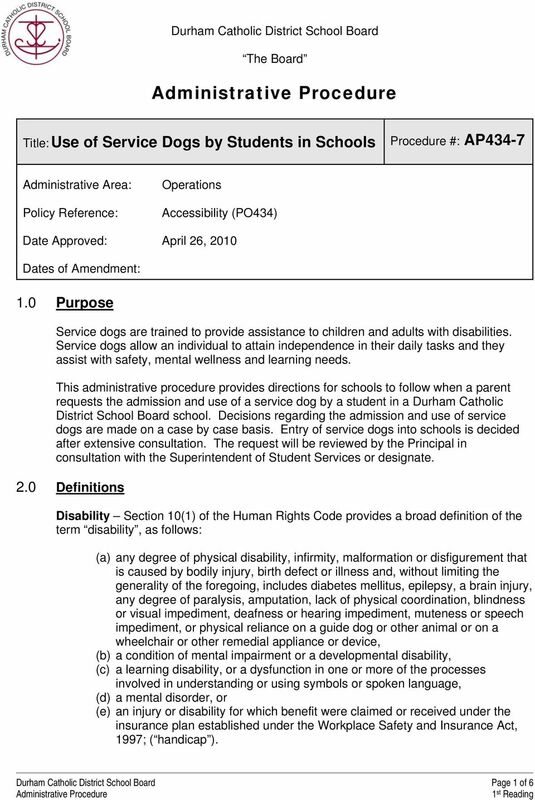 The use of the service dog will be reviewed annually (within the first 30 school days of each school year) or as deemed necessary by the school administration or the student s parent(s)/guardian(s) and/or student 18 years or older. 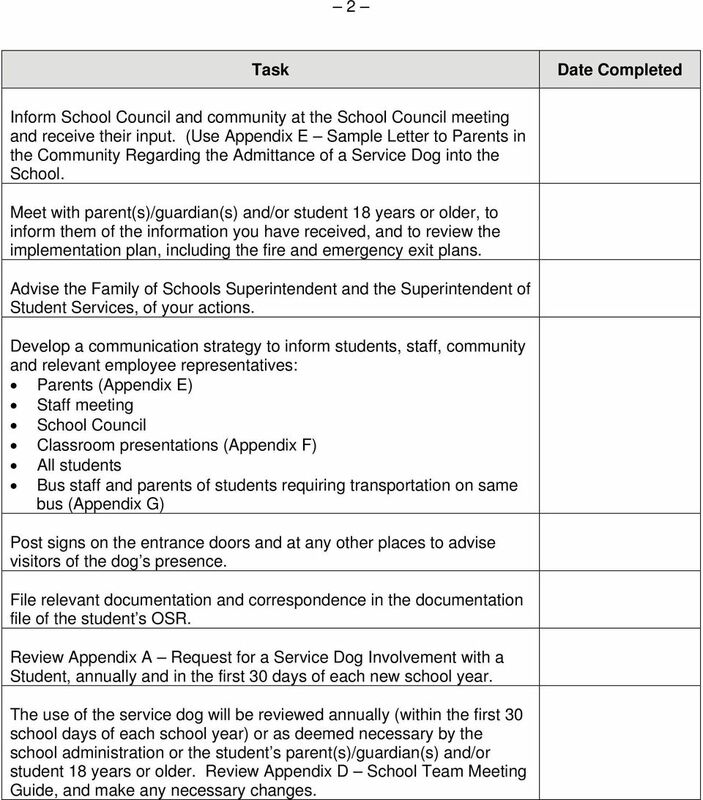 Review Appendix D School Team Meeting Guide, and make any necessary changes. 1.2 THERAPY OR COMPANION DOGS: A therapy dog visits people in nursing homes and hospitals to bring love and companionship into their daily routine. SUSPENSIONS. A record of the suspension will be included in your child s Ontario Student Record (OSR). TABLE OF CONTENTS DURHAM STUDENT TRANSPORTATION SERVICES MISSION STATEMENT 1 TRANSPORTATION POLICY 1 1.0 ELIGIBILITY GUIDELINES 2 2. The Education Act does not require school boards to provide transportation. Therefore transportation is a privilege not a right. Does the student have special medical needs in the event of emergency medical treatment? 2012 2013 Student Application Student Information Student Name: High School: Grade: Age: Birth Date: Birth Place: Will the student be carrying a valid passport? Yes Does student require a valid passport?